Rapnews.co.uk Rapnews.co.uk UK rap, grime and hiphop culture resource! » Blog Archive » Win Tickets to Kung Fu’s 6 Birthday Bash! Win Tickets to Kung Fu’s 6 Birthday Bash! Kung Fu celebrate their 6th birthday on the 27th of April at Fabric in London. 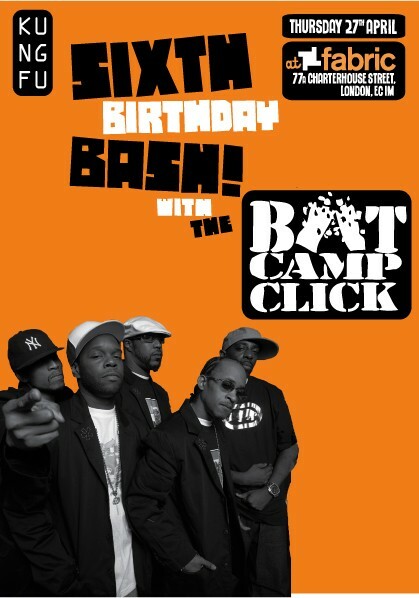 Taking to the stage will be The Boot Camp Click (NYC), Black Moon, Smif ‘N’ Wessun and Heltah Skeltah. Also performing will be Yungun, Verb T, Jehst Red, Rosie Wilson, Ramson Badbones and many more. And it wouldn’t be a Kung Fu event without the dope DJ’s Harry and Sarah Love, handling the decks along with Mr Thing and Renegade. To win a pair of tickets to the event, simply answer this simple question. Yungun a.k.a Essa is performing at Kung Fu’s birthday bash. Name two other alias’s he rapped as on his compilation album ‘The Essance’. Get your answer in by the 20th of April. Good luck. If you’re not lucky this time, you can pick tickets up for the night via Ticketmaster on 0870 902 0001 or www.fabriclondon.com For further information, call 0207 424686, e-mail [email protected] or visit www.kungfu-london.com.